If you're on the Atkins diet or avoiding carbs generally I would suggest you stop reading now, this is probably one of the single biggest carbs hits your ever going to get in one dish. 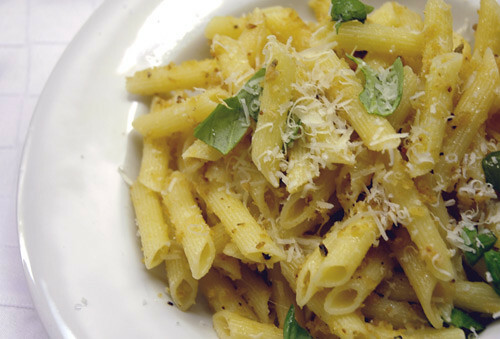 It really is such a simple idea, good olive oil, garlic, some chilli, parmesan, breadcrumbs and a dash of red wine vinegar tossed through some penne and topped off with a handful of torn basil. It takes as long to make as the pasta takes to cook and frankly it is the best pasta dish I know how to make. I sincerely mean that. Now, I make a stunning carbonara, if I say so myself and my bolognaise it a joy to behold, yet there is something about this dish that satisfies at a deep level. You'll want to use some stale bread, make sure it is a decent loaf, I use a granary, which adds a nutty quality to the dish and sets off beautifully against the slight sharpness of the vinegar. Ummm. Didn't Dr. Atkins die of a heart attack? I say bring on the carbs. Crumbs. Very important to cook with crumbs.